The 702010 Forum recently launched a 70:20:10 Practitioner Certification program (watch a video overview). I participated in the pilot of this program last year and see tremendous value in the way it supports me to improve the application of the 702010 framework in my organisation, while also recognising my development as I do my work. There is real integrity in the 702010 approach that is built into the certification. I’ve decided to post my certification pathway and progress reviews on my blog rather than just on the 702010 Forum so that I can share it more widely. In this post I share how I have scoped my work requirements and certification pathway. Participants are asked to apply a performance analysis approach to the scoping step, which is then used to structure this initial post. Coca-Cola Amatil (CCA) produces and distributes a range of beverages and some food items including carbonated soft drinks, fruit juices, water, dairy drinks, alcoholic beverages, fruit, coffee and tea. In early 2012 CCA established the Supply Chain Technical Academy. After a number of years of capital investment, a need was identified to ensure that we could continue to develop the capability of our people to use these platforms and systems. The Academy developed competency-based blended learning programs. These programs include theory (10), learning from others (20), and learning from experience (70). The three elements were included in structured programs, culminating in skill assessment on-the-job. By early 2014 the Academy had largely delivered on the initial mandate of developing training programs to support the major capital investment program, which had come to an end. CCA’s market conditions had become tougher and profitability was reducing. Supply Chain’s business strategy had been updated, shifting focus to productivity in order to realise the benefits of the capital investment program. It was time to refresh our Capability strategy. I had joined the 702010 Forum in September 2013 and became aware of how many different ways there are to support social and experiential learning. It struck me that CCA had narrowly interpreted the 702010 framework, and were missing many valuable, lower cost opportunities to support learning and improve our business results. While I commenced individual 702010 certification as part of the Forum’s pilot in September 2014, I have used the Forum to support development and execution of the refreshed strategy described in this journal post. Sponsor – My manager, the Head of People and Productivity – Supply Chain, is sponsoring my certification. A Supply Chain Technical Capability Governance Board was established in mid 2012. The Board consists of a range of senior National and State managers. It sets and oversees Capability strategy. The Board helps me to align capability activities to business strategy and priorities. National and State managers of functions such as manufacturing, maintenance and logistics – The Capability strategy must help them to improve their team’s business results. I work with them to develop specific learning programs that suit their team’s characteristics and working environment. Capability Community – This group are both stakeholders in my certification and support in that they are co-contributors to the work that is in certification scope. Academy team – five people in addition to myself, who develop and coordinate national learning programs. Additional ‘Capability Consultants’ – people who take a lead role on development of specific Capability, but are not a permanent part of the Academy team. State Capability Managers – one per Australian State (geographically structured role). These roles report to State Supply Chain Managers. They plan and execute technical and compliance training locally using a mixture of Academy and other programs. They are key local change and communication agents for the Academy. Indirect Support – I shall work with IT and HR on specific initiatives. I shall also use my external Personal Learning Network for support. I may also engage external specialists to assist with specific initiatives. – Reducing business profitability due to changing market conditions, with a negative impact on share price. – Business cost reductions, reducing workforce size. – Completion of a multi-year program of investment in a range of Supply Chain platforms and computer systems. Capability performance was reflected in a SWOT analysis undertaken in March 2014. I conducted individual discussions with the Governance Board members and Capability Managers gathered input from functional managers in their States. The SWOT was finalised at a 2 day Capability Community strategy workshop. In summary, we had embedded a new consistent, clear model of competency-based Capability development aligned with business priorities, and the Community had earned credibility in the business. This has been a significant shift from the previous model where each State independently developed technical capability. Managers across Supply Chain told us that we had focussed on the right capabilities, and they felt that the programs met their needs. However, activity metrics showed that utilisation of formal programs was low. Engagement of local teams with Capability needed to improve in most States. We were also concerned that knowledge sharing across States was low. – rapidly develop emerging technical skills required in the business. For example, improve maintenance planning skills in order to reduce unplanned equipment downtime. – use more responsive learning strategies. While the competency-based programs provide a foundation by sustaining critical core technical skills and knowledge, they do not enable continuous learning while working. They also require a lot of resource and time to develop. Our Capability Strategy clearly needed to be refreshed to maintain alignment with the business strategy. 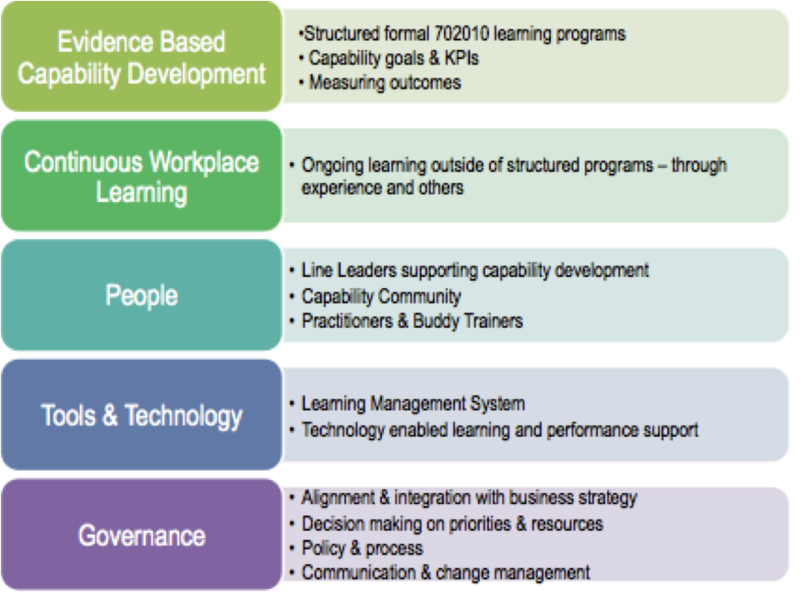 To continue developing capability-based learning programs would mean that we invest a lot of resource in increasingly lower priority business capabilities. We simply could not keep up with business needs and risked becoming irrelevant. The refreshed Capability Strategy contains five elements as per the diagram below. We have a three year road map of key initiatives for each element by year. I shall focus on knowledge sharing as part of building a continuous learning culture for my 702010 Certification. This includes Communities of Practice and other forms of embedding and extracting learning through knowledge sharing. However, I shall also use the 702010 Forum resources and community to support other activities included in the strategy. – Improve SharePoint infrastructure so that it could be used effectively for knowledge sharing. – Engage and enable the Capability Community to support knowledge sharing by other groups in the business. – Develop knowledge sharing across CCA’s (1) Maintenance and Engineering teams, and (2) Systems Super Users and Key Users. This entry was posted on June 26, 2015, 6:22 am and is filed under 702010, Show Your Work, Working Out Loud. You can follow any responses to this entry through RSS 2.0. You can leave a response, or trackback from your own site.